I turn off the road just south of Kidwelly and follow the Wales Coast Path over the railway line. At this point, I decide to diverge from the official coast path. A public footpath will take me along the raised bank of the creek and, therefore, much closer to the water, thus obeying my Rule Number Two. My current OS Map is called Carmarthen and Kidwelly, implying Kidwelly is a place of some importance. I can see the church spire and castle ruins through the trees. If I wasn’t feeling so tired and hungry, I might have made another diversion and gone to explore the castle. But I’m heading for a place called Kidwelly Quay. It has a car park marked on my map, and I’m hoping to find a café or a pub there. My alternative path is narrow in places and – despite not being a bridleway – is covered in horse manure. But it’s lovely. I have marshes to my left, flowering bushes to my right. Across the marshes I can see a distant shoreline. I’ll be walking over there one day, I think to myself. I emerge from my footpath and rejoin the official Wales Coast Path for a short distance, where I come across other walkers and cyclists. I stop to read an information board, and one cyclist comes over to talk to me. He recognises me, before I recognise him. It’s the man I met earlier – the man who played chicken with the bullocks. ‘Can you get along there?’ he asks, indicating the footpath I’ve just left. I tell him it is narrow but possible with a mountain bike. He sets off, looking a little wobbly. I hope he doesn’t end up falling off his cycle and into a pat of horse dung. Kidwelly Quay was built a little downstream of the town, after silt made it difficult for boats to navigate further up the river. A canal, and later a railway line, brought coal and other products here for loading onto ships. Once a busy port, it was abandoned over 90 years ago and restored during the 1980s. For a hungry walker, Kidwelly Quay is disappointing. There is a small car park and people walking about. But no café. Not even a kiosk selling drinks or snacks. Luckily I’ve brought some food with me, and I sit on one of the picnic benches (there are plenty of those). I even manage a self-portrait. After leaving the quay, I follow the Wales Coast Path along a quiet road and into Kidwelly, heading for the road bridge over the Gwendreath River. I pass a sewage farm, cross a railway line, walk past an enticing pub (if only I’d known it was here! ), and a fire station. The main road through the town is attractive with painted houses and banners fluttering. Maybe a festival of some sort? But I don’t stop to look around. It’s nearly 3pm and I need to continue to Ferryside, where my husband is meeting me at the pub. It’s not very far to go, but I’m still undecided as to which route to take. I cross the river and follow the bank, walking on a pleasant path through a park. A family are picnicking and their two dogs race towards me, one barking furiously and, as he gets closer, he starts snarling with bared teeth. I wish owners wouldn’t tell me their dog doesn’t bite. It’s the dog that needs telling. ‘Hello doggy,’ I say in my most dog-friendly voice. But he doesn’t put his head down and wag his tail, which is what usually happens. Just keeps growling, ears back, teeth showing, saliva drooling. I really, really wish I had my poles with me. I’m going to get bitten. The dog makes snapping movements. But backs off at the last moment. After this I feel rattled. Phil Smith, a walker who wrote the wonderfully weird book, On Walking, is afraid of dogs. I like dogs, have owned several in my life, and I’m not usually fearful, but that was an unpleasant encounter. After the park, I’m forced to walk along a road. Actually, I have to walk in the road. There’s no pavement and no clear verge, so I have to walk on the tarmac. I would rather be down near the water (where the railway track runs), but there are no footpaths down there, and the road is the closest I can get to the shore. Also, this is the official route of the Wales Coast Path. Luckily the road is pretty, with wild flowers, and traffic is fairly light – only one car every minute or so. The road rises and my spirits lift with it. The sun is shining, a fresh breeze is blowing and I have a clear view over the fields and farms, across the mouth of the river and the marshes, to the distant line of trees that mark the edge of Pembrey Forest. I’ve come a long way today. And now, with a firm surface under my feet, I’m making rapid progress. 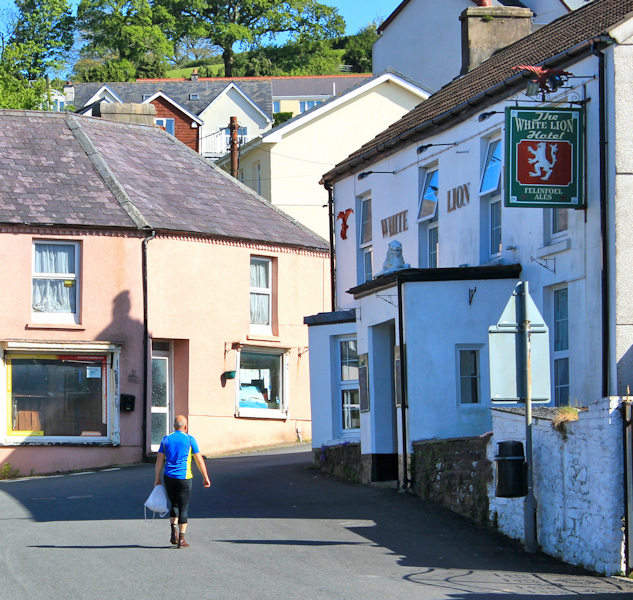 After a mile or so, the coast path takes another of its inland detours, climbs a track up a hill and meanders through the village of Llansaint, before coming down again to the water’s edge and the village of Ferryside. All day I’ve been trying to decide what I might do at this point. Follow the official path or stay on the road? Now, when I have to make my mind up, I decide to keep to the road. The traffic is bearable and this way I walk closer to the water, so the road route is consistent with my Rule Number Two. Of course, even after I’ve made it, I worry constantly about this decision. Will the traffic get worse? Will I regret my choice? What views am I missing on the higher route? Further along I walk past a turn leading down to a holiday park. A steady stream of cars are turning in and out. Loud music blares up from the park. This noise would normally irritate me, but today I don’t mind. It’s cheerful and my pace speeds up in time to the beat. The air seems full of bright light. I can even see across to Llanmadoc Hill and Rhossili Down. After passing the holiday park, the traffic disappears completely and the road narrows. I lose the view of the sea, but enjoy this section of the walk almost as much as I enjoyed the beach walking earlier. Wild flowers crowd the verges. I can’t resist a footpath sign leading off to the left. Perhaps I can walk along the shore? The path takes me across the railway line and I find myself looking down onto a small rocky beach. This is ‘Ishmael’s Scar’ according to my map. A family is sitting below. The children are splashing about in pools. The parents are lying in the sun. As I walk back across the railway line, I stop to take a photograph along the tracks. I definitely want to take this particular rail journey. Think of the views! Back on the road and I walk past a graveyard, the tombs arranged in terraces on the slopes. What a wonderful place to be buried. I meet one of two cars. And a couple of horse riders. Then, through the bushes on my left, I catch glimpses of the estuary below. This is the mouth of the River Towy. It does look muddy and I’m glad I didn’t try to walk along the shore. I take photographs. The colours are mellow in the soft light of late afternoon. The road runs downhill and a sign says Ferryside. But, when I pull out my map, I realise I’ve still got a mile to walk until I reach my rendezvous point at the pub. Ferryside is a long village. The Wales Coast Path does another one of its veering-off-the-coast acts. It goes up the hill, and takes another route through the village. But I stick to the coast road. And I find a tunnel under the railway. Through the gap I can see a castle on the hill across the river. It will take me another two days of walking until I get there. Llansteffan castle. I walk under the railway line, scramble across some rocks, and find myself on a beach. A beach? I wasn’t expecting this. There are people walking on the sands. It feels much more seaside than riverside. Surprisingly clean for an estuary. Not mud, real sand. Soft and very deep in places. And, just like the beach at Pembrey, the shore is dotted with washed-up jelly fish. I wonder if they’re a constant feature of the area, or just a temporary plague. I walk along sands for a while and draw close to the main access point from the beach into Ferryside. Turning seawards, I take my last view across the gleaming mouth of the Towy. Then I head up into Ferryside – but am delayed when the railway-crossing closes its gates. A train passes by. The station here is a request stop. Perhaps it’s a pity I’ve arranged to be picked up by car? The train journey back to Swansea seems tempting. I cross over the line via the pedestrian bridge and, from the high vantage point of the bridge, I see a man in cycling gear walking up the street. It’s my husband! He doesn’t see me on the bridge or hear me call. Where is he going with such pace and determination? When I arrive in the bar, he has been asking about me. Has anyone seen my wife who is walking around the coast? Oh, here she is, she’s just walked in. And I get a round of applause. That’s never happened to me in a pub before. This entry was posted in 12 South Wales and tagged hiking, photography, travel. Bookmark the permalink. I really enjoyed that part of the walk and the next. Dylan Thomas country. That castle is worth having a look at. I did this walk the other way round but took a similar route. Like you I can understand why the coast path diverts away from some roads (e.g. A-roads) but the diversion you mention at Llansaint makes no sense to me either. I took to the beach at Ferryside and followed the shore (rocky in places) to the caravan park then walked through the caravan park and took the road the rest of the way. I took the same path as you around the marsh at Kidwelly too. I shall be interested to hear how you get on on the next section. I think I got a bit lost on that one! Kidwelly looks lovely in the sun, it was a miserable wet day for me. Ah, so you can walk along the coast after all. The road was fine though, and better when I lost the caravan-park traffic. Just written up the next section. I didn’t get lost, but it wasn’t a good day! This is a brilliant reminder of my walk around Wales, oh to do it again, you have some great coast coming up, keep on doing what you are doing and i will enjoy reading about it. As an animal lover I’m loathe to admit it, but animals are the one thing that might make me divert off a footpath – well them and weirdoes, but fortunately there are a lot fewer of them. It’s not actually the animals that are the problem though, is it, but rather their inconsiderate (or bloody.-minded) owners. I seem to have a lot of trouble with animals. Thought it was just me! You’re certainly not alone when it comes to trouble with dog encounters! As you say though, it’s the owners that cause the problems by letting their animals approach random strangers in the first place- they’d never let their children do it, so why the dog? Enjoy the views from the castle. What an interesting walk. The dog experience is one ive had far too many times. I quite like dogs too but not strange growly ones. The little villages were enticing and the views make me want to get on a train and go to Wales. I did this bit in reverrse. Is the churchyard St Ishmael’s , friend of mine said his grandparents buried there. Had a wander around it but lots of Thomas’s. Kidwelly Castle worth a look, same friend reckons it is largest uninhabited castle in Wales or the U k or maybe the world, us Welsh not noted for exaggeration. The graveyard was very atmospheric and a fine place to be buried. Never did get to look around the castle… but maybe I’ll go back one day. What a lovely walk. I’m enjoying all your posts of South Wales. What fun that you got a cheer when you enteres the pub!